Camera Obscura continues to release some of the most forward-looking music of the new millennium, and Greyscale's debut full-length CD only adds to the company's growing reputation as a harbinger of accessible but experimental music. The technicians that power the Greyscale soundcraft include Paul Rigby (an assortment of guitars and stringed instruments), Cass Wigley (guitar, bass, synth, keys) and Paul Sloan (drums, radio transmissions). But the driving force behind many of the songs on Cruel Machine is Rigby's unconventional use of pedal steel guitar as both a lead instrument and a textural tool, similar in execution to David Gilmour's use of this traditional country axe on Dark Side of the Moon. Perhaps because of this, parts of Cruel Machine have the feel of a nastier, more industrialized Floyd, though a more accurate comparison might be to fellow retro dream futurists Kinski. Both "Brute Force" and "Flight One Hundred," for instance, create a delicate tension between ambient bliss and industrial fire; an odd but compelling merger of styles to be sure, but one the group pulls off successfully. Sloan's pinpoint percussives and Wigley's electronic embellishments form wide-scope cinematic backgrounds over which Rigby's arsenal of heavily effected guitars glide like jeweled birds in a neon skyline. Pieces like "Warm Retreat" and "Tryptanology" inexplicably but inventively fuse country & western phraseology and melodicism with flourishes of noise rock and electronica. 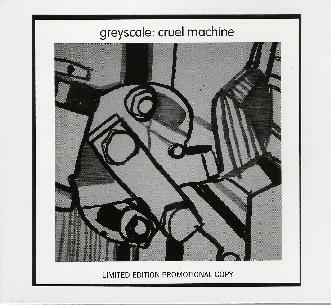 Ambient western might be the best way to describe much of the music on Cruel Machine, though ambient industrial western might perhaps be more representative of the collision of styles that Greyscale obviously enjoys smelting in its own peculiar forge. Designations and labels aside, Cruel Machine is a bewitching spell book of eclectic incantations for the aural adventurer. For more information you can visit the Greyscale web site at: http://www.recursiverecoreds.com/greyscale.